Anchorage location 2° 30'.77 N, 106° 02'.58 E 16. The anchorage is located in the middle-sized of the three lagoons. The other two lagoons are surrounded by shallow reefs, which prevent access by vessels bigger than a dinghy. Meanwhile, the reef entrance is indicated with a set of buoys about 20 m apart. (Location: 2° 30'.654 N, 106° 02'.206 E). The water depth in between these buoys is about 3 m at its deepest, the entrance edges rising to more shallow. Keep in mind also the presence of coral heads. High tide and adequate lighting with little or no reflection is recommended when entering the lagoon. Once inside the lagoon, it deepens steeply to 15-20 m, depending on the tidal range. Pulau Bawah's lagoon is a known shelter amongst the fishing community here. You'll be able to hear their pompongs from far, because the characteristic put-put sound of these diesel-operated fishing sampans tends to carry. The lagoon and surrounding waters have plenty of coral, flora and pelagic fauna. It makes for excellent snorkelling and scuba-diving. The panoramas at Pulau Bawah are gorgeous also, so go for a walk if you have a chance. You can even climb the face of Bawah. The views are spectacular. Incidentally, there are no real facilities on Pulau Bawah, apart from a resort that's under construction. There's also an anchorage within the Tarempa harbour itself, just off the Navy Jetty and a stone's throw away from the speedboat jetty. The coordinates are at 03° 13'.12N 106° 13'.14E. Water depth is more than 20 metres and the sea floor consists of mud and debris. 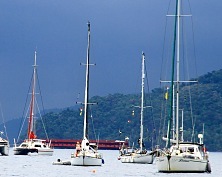 This anchorage runs more or less parallel to the little road that leads from Tarempa to Tanjung Tebu. FYI, there's is a reef between the anchorage and this road. 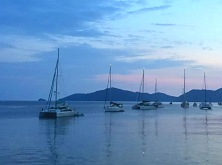 Incidentally, this particular anchorage tends to be the anchorage of choice during the yearly Sail Anambas. The Mubur Island anchorage is located at 03° 23'.04N 106° 13'.48E. The sea floor here is a mixture of sand and coral. Please take care when you drop anchor. This anchorage, by the way, is close to a lovely white sandy beach. 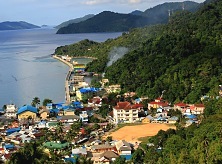 This popular anchorage, at 03°23'.59N 106°26'.89E, is close to one of the more northerly Anambas islands, Penjalin, which makes it a great stop before sailing on to Natuna. The sea floor at Penjalin comprises some sand and some coral and some rocky sections. Please mind the coral while dropping anchor. 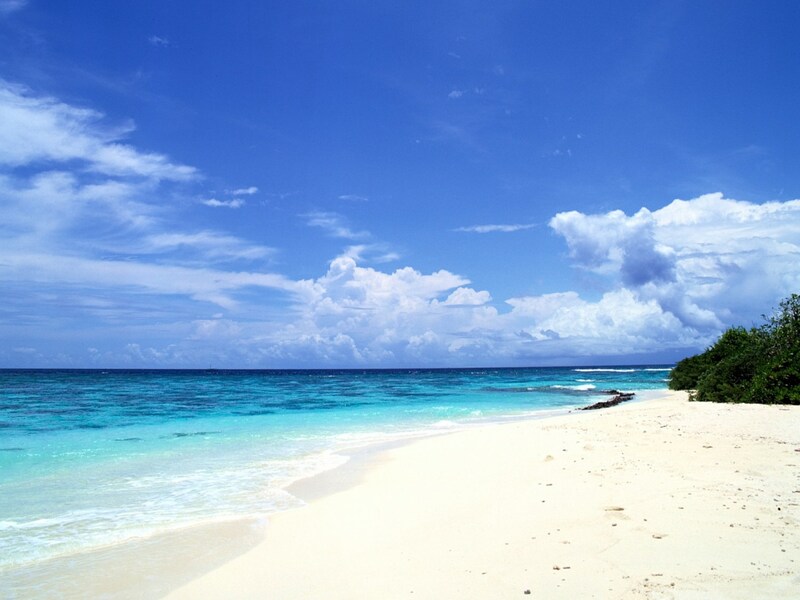 Incidentally, Pulau Penjalin is quite beautiful and offers quite a long white sandy beach. Great for a BBQ or a picnic. The beach also boasts stunning rock formations at both ends. Directly in front of the kampong itself, this anchorage is located at 03°14.68N 106°17.46E, in about 10 meters of water. The substrate below appears to be sandy and provides a decent anchor hold. It's quite a narrow channel, however, so the current can be pretty strong. Located just off Pulau Sagudampar, Moonrock Lagoon provides a great, not to mention gorgeous anchorage. The entrance requires a bit of care, due to some shallower sections, but the anchorage itself is at 13 meters of water and the bottom is sand. Thanks to Neville and Glenys Howarth for some of the anchorages and images.